Please note: Now that Overdrive offers a large selection of digital magazines we are no longer subscribing to RB Digital Magazines. If you would like more information or help with Overdrive stop into the library. ​Overdrive offers thousands of eBooks and audiobooks, magazines and selected videos for streaming to all MVLC card holders. Visit www.mvlc.lib.overdrive.com to browse the collection. You can create an OverDrive account with your library card and choose to read books in your browser with OverDrive Read or download the free OverDrive app on compatible devices. For help getting started set up an appointment at the library or visit Help.overdrive.com. For more help click here. TumbleBooks are animated, talking picture books which teach kids the joy of reading in a format they'll love. TumbleBooks are created by taking existing picture books, adding animation, sound, music and narration to produce an electronic picture book which you can read, or have read to you. 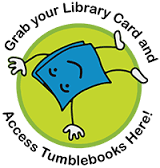 Visit www.tumblebooklibrary.com and log in with your library card or access TumbleBooks on our patron computers in the children's room. All residents, property owners, and students of Massachusetts qualify for an eCard through the Boston Public Library. A BPL eCard grants holders access to all digital resources in the Boston Public Library, including eBooks and more! Visit https://www.bpl.org/faq/managing-your-account/ecards.htm​ for more information.